From Goodreads – A powerful debut novel about the gray space between truth and perception… Quinn’s done the unthinkable: she kissed a guy who is not Carey, her boyfriend. And she got caught. Being branded a cheater would be bad enough, but Quinn is deemed a traitor, and shunned by all of her friends. Because Carey’s not just any guy—he’s serving in Afghanistan and revered by everyone in their small, military town. Quinn could clear her name, but that would mean revealing secrets that she’s vowed to keep—secrets that aren’t hers to share. And when Carey goes MIA, Quinn must decide how far she’ll go to protect her boyfriend… and her promise. As a general rule, I don’t read military-inspired books. Nor do I watch military-inspired TV shows or movies. As an Army wife of almost ten years, I find that fictionalized accounts of the military and its ways of life are often either inaccurate or incredibly melodramatic (I’m looking at you, Army Wives.) Furthermore, I find cheating/adultery to be a far-too-common plot element in military-inspired stories. Honestly. The vast majority of service members (and their significant others) are not fickle bedhoppers. 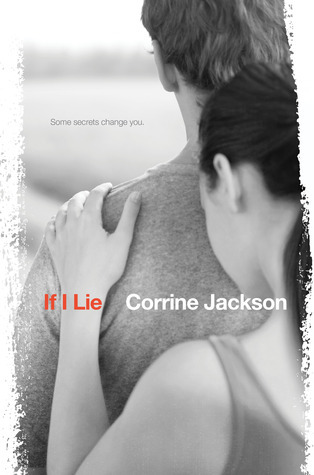 So, you might understand why it took me so long to pick up Corrine Jackson’s If I Lie. I know Cory through the Bookanistas and while I think she is absolutely lovely, I have to admit that I didn’t plan on reading If I Lie. I love a good contemporary YA novel, but this one had strikes against it from the get-go. Luckily, several of my trusted book friends read If I Lie and had all kinds of wonderful things to say about it. I realized I might be missing out, so I bought myself a copy. I flew through it in two days. If I Lie is not just a military book, nor is it just a cheating book, and it’s definitely free of melodramatics There’s SO MUCH to Quinn’s story: weighty family issues, bullying, genuine (though rather untraditional) friendships, and incomprehensibly difficult choices. Poor Quinn has so much on her plate, more than enough to crush the average girl. Good thing she’s the oft-talked about “strong female character” personified. Quinn is smart and steadfast and determined, loyal to her own detriment. And yet, she’s sensitive enough to be relatable — the whole time I was reading I just wanted to give her a big hug. The dynamic between Quinn, Carey, and their good friend Blake was incredibly compelling. Throughout the novel, Corrine Jackson jumps seamlessly into flashbacks that show the development of the trio’s friendship, as well as its unraveling. We find out on the first page of the story that young Marine Carey has gone MIA while overseas on a deployment, and his disappearance — as well as Quinn’s staggering personal growth — propel the plot forward. The writing in If I Lie is lovely, nuanced and authentic and without fluff. Corrine Jackson appears to write the teen voice effortlessly; I especially loved Quinn’s thoughtful observations about the people around her, and her dry wit. So, ignore any preconceived notions you might have about military-inspired books. If I Lie is a perfect choice for fans of contemporary young adult fiction. Please do read it soon if you haven’t already! Tell Me: Have you read If I Lie? Thoughts? Do you have a favorite military-inspired book? This one has been on my TBR-list for awhile – I’ll have to bump it up b/c your recommendations have never steered me wrong! I do hope you get a chance to read IF I LIE, Jaime, and I hope you enjoy it as much as I did. And for the record, there is MUCH more to the “cheating” story than I had anticipated. I don’t want to give anything away, but yeah… Don’t let that aspect deter you! I also usually avoid anything military-inspired, for the same reasons you’ve mentioned. My dad has been in the Navy for 27 years, so I grew up surrounded by other military families, and NOT A SINGLE ONE is like how they usually are portrayed. ANYWAY. One of my favorite things about the book was how respectfully the military was portrayed, and I loved Quinn’s relationship with all of her friends at the VA hospital. I actually read this entire book during a Seahawks game…so that’s pretty much the highest recommendation I can give. I loved the parts with the Wounded Warriors too, Steph. I haven’t read relationships like that before in YA, and it was very refreshing to see how awesomely all the veterans were portrayed. And yes! YA during the Seahawks says A LOT! I’ve wanted to read this one for quite some time now. I’m not big on books with story lines about cheating either, but that bit about clearing her name if she gives away secrets made me suspect there might be more to that situation than initially meets the eye. Glad to hear that’s the case and it’s worth reading! Yes, Erin, there’s definitely more to the cheating than I’d initially imagined. I think that if you read this book, you’ll find that it redeems itself on that level. In fact, I think you’ll really enjoy the entire story! I’ve heard a lot of good things about this one, and the cover makes me shudder a little (in a good way). It’s fantastic, Matt… A definite recommend! I’m SO glad you ended up loving this one! I was a little nervous because of the military stuff, so I’m glad it was one you connected with! I love how all of the characters in this book were so multi-faceted. No one was just “good” or “bad” or “right” or “wrong.” There were so many shades of gray, and I love that in books. I do too, Jess! I wanted to be angry with Carey for using Quinn, especially toward the end of the story. But at the same time I totally got why he did what he did, right or wrong. Everyone in this story was so far from perfect, it made it easy to relate to them as real people. Love that!